Since the Saudi-led coalition declared war on impoverished Yemen: March 26, 2015, foreign journalists and independent news organisations have been prevented from entering the country – de facto putting Yemen under a media blackout. If such infringements on freedom of the press are indeed criminal as they speak of a grand political cover-up, Yemen’s media blackout has reached too grand proportion, and compounded to such an abysmal betrayal of journalistic standards that silence must absolutely be broken. The danger here is not so much in this silence Saudi Arabia’s war coalition architected around Yemen, so that only its voice would reach the ears of public opinion, but that our well-thinking, well-to-do so called free press was hijacked to the agenda of a minority few to purposely mislead. Yemen’s media blackout has many layers … each of which screaming of an exercise in propaganda, misinformation, and more to the point manipulation. Yemen is merely a symptom of our media apparatus’ malady. One bolder may even elude to folly as without a free press we might as well surrender free thinking to fascism. Free press those days has become yet another euphemism for political indoctrination. If we can can agree that absolute impartiality is indeed impossible since our prejudices and filters very much make us who we are as individuals, a line should be drawn at organised media dishonesty … and in the case of journalism: make-belief. The under-lining issue surrounding Yemen’s media blackout is not necessarily access but rather the vacuum such lack of access has allowed. If Yemen needs of course to be open to the scrutiny of the press and by extension the public, mainstream ought to serve as an information medium and not as it is currently doing, turn itself into an asymmetrical of war. For three years Yemen has suffered one of the fiercest and most vengeful military campaigns ever unleashed against a sovereign nation since WW2. If we consider that not even the devastation bore by Syria compares to the ravages endured by Yemen, readers may begin to appreciate the extent of our media apparatus deceit. Since, Riyadh’s fury towards Yemen has reached dizzying heights … such in fact that the kingdom has deliberately, and systematically targeted unarmed civilians to spend Yemenis’ will to resist and thus dismantle from within political opposition. A survey conducted by the Yemen Data Project revealed in September 2016 that over a third of all Saudi-led air raids on Yemen have hit civilian sites, such as school buildings, hospitals, markets, mosques and economic infrastructure. The independent and non-partisan survey, based on open-source data, including research on the ground, records more than 8,600 air attacks between March 2015, when the Saudi-led campaign began, and the end of August 2016. Of these, 3,577 were listed as having hit military sites and 3,158 struck non-military sites. Yemen is not at war with itself as mainstream claims. Yemen’s war came by way of a foreign invasion. Yemen’s war has been manned by foreign hands from Saudi Arabia’s seat of power: Riyadh. More than any other war in our modern history, Yemen’s war has been labelled under grave misapprehension – decontextualized and politically vulgarised. Under our own legal definition Yemen was declared war to, and therefore was within its sovereign rights to defend itself. Yemen is being torn apart, its borders have been breached, its skies darkened, its land set ablaze, its people wrecked by pestilence and famine while our press has systematically deflected blame, mudding the waters so that we, the public, would not demand accountability for the many lives lost. “Millions of lives are at risk in Yemen because food, fuel and medical supplies are being deliberately delayed on entry to the war-torn country by the Saudi Arabia-led coalition and then further delayed in distribution by the country’s Houthi authorities,” Amnesty International warned in a report released in late June 2018. The 22-page report, Stranglehold, shows how the Saudi-led coalition has imposed excessive restrictions on the entry of essential goods and aid – de facto holding an entire people hostage so that victory: political and military, could be claimed. War today has its own language and it reads like deceit. Under its ink, a person’s life – the value put on someone’s right to live free from harm and oppression has become contingent to geography, political beliefs, and religious affiliations. Yemen happens to sit beyond this invisible line where one’s fate matters, and one’s right to think independently is admissible in a court of public opinion. When not even numbers add up we must admit defeat. 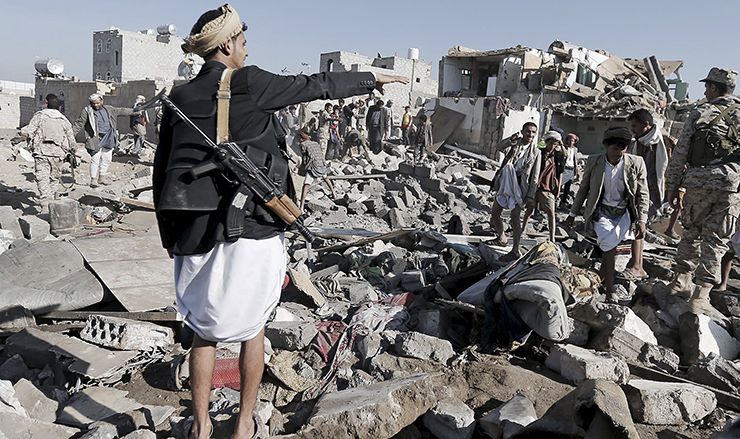 For well over a year Yemen’s death toll appears to have been frozen in time. Before the ravages of cholera, famine, bombing campaign, raids, and other military niceties we have been told that Yemen’s death count lies below the 20,000 mark … some media went as far as to claim 10,000 in their efforts to downplay genocide. While I will admit that getting information from Yemen is more than just challenging … the onus being on Saudi Arabia for making access almost impossible, war mathematics have revealed frightening numbers. In December 2016, UNICEF reported that a child dies every 10 minutes from preventable diseases such as diarrhoea, malnutrition and respiratory tract infections. And the UK-based NGO, Disasters and Emergencies Committee’s recent report put the number of deaths from preventable causes at 10,000. As for Yemen’s cholera epidemic – a direct result of Saudi Arabia’s aggression on Yemen WHO attested that by July 2017 at least 2,177 deaths had been registered. To famine … Famine is now threatening over half of Yemen’s total population, throwing millions more into food insecurity. In January 2017 The UN security chief said millions would die as a direct manmade result of the war. So much for 10, 000 or even 20,000. If those numbers are in themselves harrowing, they do not offer a real reflection of reality – quite simply because reality is being kept from us for a lack of access and fair reporting. Maybe now would be the time to reclaim some of our power and demand for truths to be told, however painful they may be.